Study originally conducted by Ken Potter in August 1998 with overlays created from photos shot from coins provided courtesy of Jose' Cortez. Follow-up study conducted in August 2004 based on overlays created by Billy Crawford to reaffirm findings of 1st study. Images shown here are from the 1st study. See the end of the article for a link to Crawford's overlays. 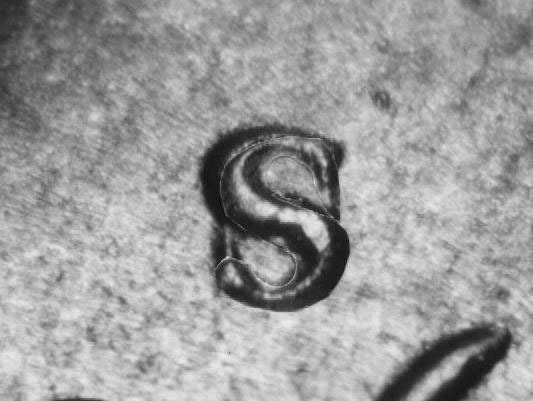 cut out (from another photo) and pasted over the other S as a Vertical over Inverted S.
Note that this results in the same configuration we see on the so-called S/D dime. In response to the Crawford’s overlays, (mine had not been rereleased at this point), John Wexler, well known variety specialist, attributer and author, who shares Coin World’s, Varieties Notebook column with me, said: "After studying Billy's overlays very carefully, I personally am convinced that this is the S over Inverted S. The overlay is virtually a perfect match for what is seen on the actual coin." James Wiles, who oversees the 20th Century Variety Coin listings for CONECA, said: "I am fairly well convinced this is an S over inverted S. The clincher for me is the notch on the upper side of the vertical bar. This notch is characteristic of the mintmark style and is found on the lower side of the vertical bar. To be found on the upper side would require the (S Mint mark) punch to have been inverted." In a later phone interview he stated that he had long felt the OMM designation was questionable and in light of the results of the current studies, he said he will be changing the CONECA attribution of the variety from an OMM to an RPM." The variety was originally listed into the CONECA files as an OMM by a predecessor to Wiles. John Bordner, president of the National Collectors Association of Die Doubling, and attributer of all RPMs, OMMs for the Wexler files said: "A few years ago I purchased a BU copy of this variety for $150.00. At the time I has reservations about the coin being an OMM when I examined it. I put it in my collection and made a note to do a further study. I am [now] totally convinced that the variety has an inverted S secondary mintmark. I have relisted the variety as WRPM-006 for the1950-S (ten-cent) files." 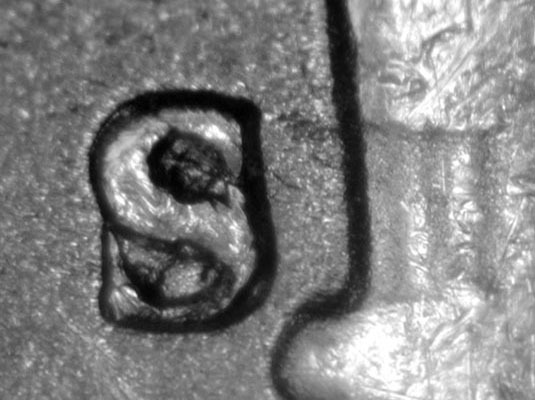 Crawford, who is author of A Detailed Analysis Of Lincoln Cent Varieties and lists all US varieties said: "I’m listing it in my files as 1950-S over Inverted S CRPM-001; it is my opinion from the recent study on the coin ... that it exhibits an S over inverted S rather than the S/D it had previously been attributed as by others." Jose’ Cortez, who is webmaster of a Washington quarter varieties web site and contributed coins to both the 1998 and latest studies said: "Ken put a lot of effort in trying to clarify his assessment of this variety. He had me send him coins from the Washington quarter series that were clear OMMs; he did all he could to duplicate the same with the Roosevelt dimes but the only thing that worked was the inverted S overlays. Now that his work has been reaffirmed by Billy Crawford, everyone can confidently get their files reorganized to show the variety for what it truly is." Bill Fivaz, coauthor with J.T. Stanton of the Cherrypickers’ Guide To Rare Die Varieties, (the first book to publish the variety as an OMM listing), was the lone dissenter saying: " ... I still feel this is an S/D. My platform is the straight line on the lower left portion of the "S", duplicating the vertical of a "D", which shows very nicely on the second (Crawford) overlay - nice and clean. If this were an inverted "S", the upper serif (the area in question), wouldn't be straight, but more triangular shaped, as is the upper serif on a Trumpet Tail S, which this is." So what does the future hold for this variety? With a majority opinion debunking it as an OMM, will it fall out of favor and drop in value? The fact is, we just do not know. Supply and demand will, as always, dictate future value. We suspect that the uncertainty surrounding the coin may have been a factor for it dropping in value in recent years. The Red Book priced the variety in 2003 edition at $350.00 for MS63 which by the 2005 edition had dropped it to $250.00. It is one of very few coins that actually dropped in value during this period. The EF value at $75.00 remained unchanged. Perhaps the adjustment has already occurred? No matter, the vertical over inverted subclass of RPM is truly rare in it's own right. In fact, it is far less common on United States coins than Over Mint Marks. Of the approximate 2,000 RPMs listed in the CONECA Master Listing (at www.conecaonline.org), literally dozens are subcategorized as OMMs while only seven are designated as vertical over inverted Mint mark varieties (this newest one will make it eight). Most variety specialists pay special attention to the rare RPM subclasses of vertical over horizontal and vertical over inverted Mint marks, and many of these varieties have achieved significant values with perhaps the 1946-D over Inverted D Jefferson five-cent piece being a better example. This piece lists in the 3rd edition of the Cherrypickers’ Guide for $250.00 in MS63 and $450.00+ in MS65. To paraphrase Cortez, the reattribution of this coin into its correct class, does not mean it no longer holds significant value or interest. It is a rare variety type and a coin that is very difficult to find. It should continue on as one of the keys to the series. See the complete story in the September 13, 2004 installment of Coin World's, Collectors' Clearinghouse!